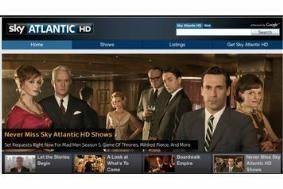 UPDATED: Sky Atlantic HD channel launches tonight | What Hi-Fi? Fans of Award-winning Mad Men, wrestled from the BBC by Sky, will be able to see series five on Sky Atlantic in August, along with a new UK series from Paul Abbott, Hit and Miss, about a pre-op transsexual contract killer. Full details of Sky Atlantic's programming schedule are on the channel's website. Sky is making a number of changes to its EPG (electronic programme guide) which it says mark "one of the biggest updates to its channel line-up for more than a decade". The upgrades include: a high definition 'channel swap' for Sky+ HD subscribers; the relocation of a range of leading pay TV channels on the EPG; and the launch of another HD channel, Sky Atlantic. • For Sky+ HD subscribers, 40 channels in Sky's HD pack will swap positions in the EPG with their standard definition counterparts. For example, they'll find Sky 1 HD at channel 106, with Sky 1 SD moving to channel 170. Customers not subscribing to Sky+ HD will not be affected by the change. • MTV, Comedy Central, Universal, SyFy and FX (and their associated HD channels) will move to higher profile channel slots (126, 112, 113, 114 and 124 respectively). • Sky Atlantic launches: it's a new channel devoted to 'hot' shows including the best of HBO, cult shows such as Mad Men and original UK commissions such as Paul Abbott's Hit and Miss, all on channel 108. • Living will rebrand as Sky Living and will move to channel 107, to sit between Sky 1 and Sky Atlantic. "The combination of high quality content, an intuitive, easy-to-use EPG and innovative services like Sky+ HD and Sky Anytime+ means our customers benefit from real choice, control and flexibility," says Sky's commercial director Rob Webster.